This motor boat's function is to pull a banana boat with some passengers on top of it. Captured in one morning around Pangandaran Beach (West Java, Indonesia). cute :) hehe. i want to ride on one of those. visiting you back for MYM. Beautiful boat. I like it, but I'm afraid of the sea. 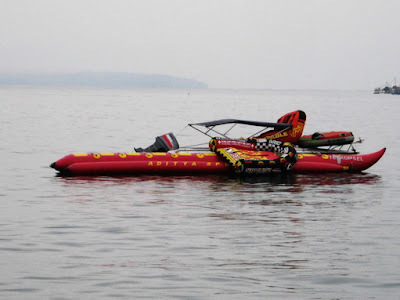 Cool red & yellow boat pic ! beautiful yellow motor boat :-) Visiting from MYM, hope that you can return the visit too. Love the colour. Great shot.